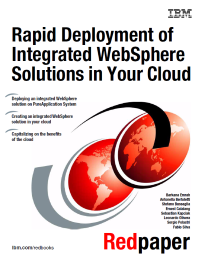 This paper shows, in step-by-step fashion, how to bring an existing solution to the cloud using IBM PureApplication Systems and how, by moving the solution to the cloud, several steps, which are conventionally carried out manually, can be easily automated. Cloud computing is revolutionizing the way organizations provide, manage and use IT services. It builds on efficient infrastructures, improving productivity and helping to reduce administrative and capital costs. The IBM PureApplication System, part of the IBM Expert Integrated Systems family, offers a simplified experience that enables clients to deliver new cloud services and applications faster and with improved economics over traditional IT practices.